Pecan Sandies are a cross between a rich shortbread and a drop cookie. The buttery richness of these cookies is reminiscent of shortbread. Yet you can use margarine rather than butter in this recipe and still enjoy a lush flavor, thanks to the pecans which add depth to the flavor of the dough. Most shortbread, however, is baked in one pan and then cut into pieces. Sandies are individually-formed cookies. Like other drop cookies, Sandies are shaped by “dropping” or pushing spoonfuls of cookie dough onto a baking sheet. During baking, the mounds of dough flatten and spread. Drop cookie dough varies in texture from quite soft to stiff. This particular recipe produces a stiff dough that must be pushed with a finger, spoon, or spatula onto the baking sheet. Preheat oven to 350º F. Lightly grease baking sheets. Combine dry ingredients in a medium bowl. Set aside. In a separate bowl, using an electric mixer on medium speed, cream butter and sugars until light and fluffy, scraping the bowl continually. Beat in eggs, one at a time. Stir in vanilla. Gradually stir dry ingredients into creamed mixture a bit at a time until well blended. Add pecans to the dough, mixing them in with a wooden spoon. Drop rounded teaspoonfuls onto prepared baking sheets, 2 inches apart. Bake 12-15 minutes until cookies are lightly brown around the edges. Remove cookie sheets from the oven. Allow cookies to sit for 5 minutes before using a spatula to transfer them to a wire rack. Cool completely. For an extra rich, buttery flavor, use butter rather than margarine. When chopping pecans, leave in a few larger pieces. 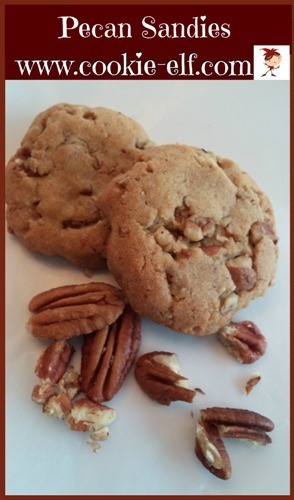 Pecan chunks in make cookies extra flavorful. Try toasting pecans to give cookies a nuttier flavor. Preheat oven to 350º F. Spray baking sheet and pecan pieces with vegetable oil cooking spray. Bake nuts for 10-15 minutes, turning once. For softer, chewier cookies bake on the low side of the recommended time. For crisper cookies, bake a few minutes longer.